In Oddworld: Abe's Oddysee you play as a slave worker at a meat processing factory called Rupture Farms, and you just found out your people are next in line to become a new Rupture Farms treat. As Abe, the Mudokon slave worker, you try to escape the factory while freeing as much Mudokons as you can along the way before you head out on your quest to bring down Rupture Farms and restore your people. Abe's Oddysee is a very underplayed game. It has a compelling story, dark and mysterious game design, a sense of humor, and challenging gameplay. I highly recommend it to anyone with an appetite for the slightly twisted. 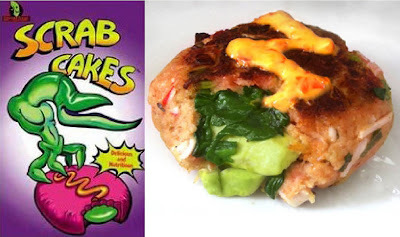 Speaking of appetites for the slightly twisted, our new recipe is for Scrab Cakes, one of the many morally questionable food products mass-produced by Rupture Farms. Made from violent but sacred creatures called Scrabs, the cakes are depicted as being a meat patty with a gooey green filling and a zigzag of some sort of orange sauce on top. In my recipe I've substituted Scrab meat for crab meat, for moral reasons. The cakes themselves are extremely flavorful, stuffed with spinach and avocado to act as the mysterious green filling, and a sort of simple spicy rémoulade to emulate the orange sauce on top. All of that delicious and nutritious scrab meat flavor, with (almost) none of the guilt. Unless you have a shellfish thing. In a pan, sweat chosen onion and garlic in butter or olive oil for a few minutes. In a mixing bowl, combine the onion, garlic, bread crumbs, cheese, 1 1/2 tbs. of the mayonnaise, 1/2 the lemon juice, cayenne, mustard, egg, salt and crab. Combine chopped avocado and spinach, and toss with half of the remaining lemon juice. If it seems too wet add more flour, if it seems too dry add more condiments. Form 4-6 flat circular medallions with half the crab mixture. Place the spinach/avocado mixture in the center of each medallion. Pat the remaining crab mixture on the top of each medallion, covering the spinach and avocado. Pat the cakes into a patty shape. Chill the cakes for about an hour. In a large pan, heat butter or oil over medium heat. Add crab cakes and cook for about 4 minutes on each side or until browned. Let cool slightly. While cooling, make your rémoulade by mixing the remaining mayonnaise, lemon juice and hot sauce together. Drizzle the sauce in a zigzag on each of your cakes. Take pictures, then eat. A little hard work never killed anyone important. The profits justify the means. Only 1,236 work related accidents this month, keep up the good work! Decapitation toll cut in half! Don't play with your food unless it plays with you first. Work hard, die young. You are who you eat. Mudokons entering this door will be slaughtered and packaged as disgusting yet yummy novelty meat products. This is amazing! When I stumbled upon it I had to read the name twice, thinking to myself that that couldn't have said Scrab. It looks super yummy and just cool all around. Thank you! I LOVE THIS GAME! trying these tonight! Awesome, awesome! What a super cool recipe! I can't wait to try it!